A team of environmentalists came across a very strange sight on Palm Beach this week, and it's causing some concern. PALM BEACH, Fla. — A team of environmentalists came across a very strange sight on Palm Beach this week, and it's causing some concern. 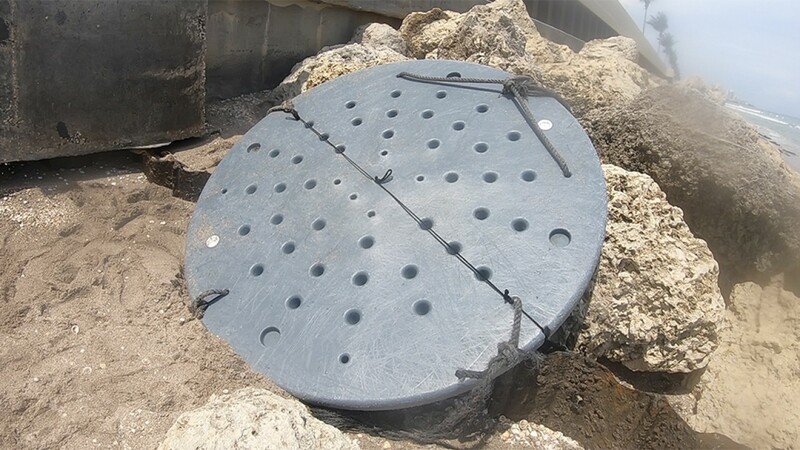 Bryan Galvin and Heather Bolint, who are on a mission to clean up beaches across Florida, discovered a large, disc-shaped object on the rocks on Sunday. Galvin said it's a fish aggregating device, or FAD, a floating object that fishermen use to attract fish like marlin, tuna, and mahi-mahi. "They have these big plastic rafts," he said. "Sometimes they’re driftwood rafts, held together with plastic ropes and they have a buoy attached to it that keeps the GPS on it and it beams data to the fishing industries." Galvin said he and Bolint also found another FAD along Canaveral National Seashore during their trek, but that one was made of wood. Some FADs are tethered to the ocean floor with concrete blocks, while others are free floating. "It’s actually cheaper to just put a bunch of them out in the ocean and let them go and that’s what they do," Galvin said. Other FADs have been reported in South Florida. Katelyn Cucinotta found a GPS buoy off Briny Breezes in November. David Kerstetter at Nova Southeastern University said Hollywood Beach Patrol alerted him to one a couple of months ago. "PEW, for example, has estimated that there may be 100,000 different types of FADs floating around on the ocean at any given time," Kerstetter said. Kerstetter said netting is used beneath the rafts to create a small ecosystem, attracting smaller fish and eventually the larger fish the companies are seeking. The fishing companies then follow the GPS signal to where they can find that big catch, but sometimes they abandon the FADs if they drift out too far. “They're marine debris, but a big vessel is going to burn thousands of gallons of fuel trying to chase it down and it’s really not economically viable," he said. The plastic FADs, such as the one found on Palm Beach Sunday, are utilited more off West Africa, Kerstetter said, but makeshift FADs are becoming more popular in the Caribbean. Scientists are looking into whether the FADs affect the natural behavior patterns of fish. "As they kind of float across the Atlantic, they're probably changing some of the behavior of the fish across the way," he said. The National Oceanic and Atmospheric Administration said FADs can pose a danger to marine life like sea turtles, which can become entangled and suffer serious injuries. “It is a growing concern and people should be aware of it," Kerstetter said. Dr. Charles Manire, director of research and rehabilitation at Loggerhead Marinelife Center, said sea turtles could get caught in the netting or ropes in certain stlyes of FADs. "If they cannot get to the surface to breathe, the turtles will drown," Dr. Manire said. "If they can get to the surface, the entangled area, usually a flipper or head, will be encircled by material that will tighten the more the turtle struggles. Given long enough time with enough struggling, the turtles can lose an appendage or suffocate. Not all of the devices have this risk, so it depends on the construction as to whether it presents a danger to sea turtles or not." Galvin and Bolint are part of Plastic Symptoms, an organization that aims to protect the environment and promote an eco-friendly lifestyle. The duo is embarking on PlasTrek, a walking mission from the Florida/Georgia line to Miami, then back up the Gulf Coast of Florida. Along the way, they're cleaning up beach litter and documenting the types of trash they're finding.